Can you hear the music play? You know how people always say, “Oh, I remember seeing so-and-so at this tiny bar in the middle of nowhere before they made it big. It was SO awesome.” Well, you can be one of those people. And you can see so-and-so, or your favorite local band, perform at a not-so-nowhere, hip venue. Check out these 5 venues for a chance to discover a Brooklyn gem. The Knitting Factory isn’t one for inaction: The music venue, opened as an experimental-noise haven in 1987 on Houston Street, relocated to Tribeca in 1994 and slowly mutated into a more accessible concert hall, until rising rent forced it to make moves once again in the summer of 2009. Its latest home is in Williamsburg. The bills are KF’s same combination of small-stakes indie rock, underground hip-hop, and oddball one-off events (Hannukah Gone Metal, the Miss Lez Pageant), writes Amos Barshad on nymag.com. Top notch indie acts and veteran critical faves look sure to pack the house while a gamut of great, on-the-verge bands should solidify the rep on the street, writes Sara Cardace on nymag.com. The owner is a set designer, so the backroom has cleverly been made to look like a train car. The real attraction, though, is the stage—which accommodates the full range of Billyburg’s sonic underground, from rockabilly to ska, writes Maura Egan on nymag.com. 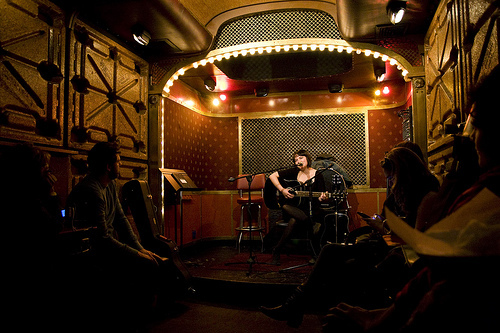 The performers are generally unknown and crowds can be thin, but it can be a comfortable place to catch a singer-songwriter. Worthy underdogs—Jeffrey Lewis, Simone White—may stop by for casual sets, according to Time Out New York. BAM Café Live is a weekly musical event featuring both established and up-and-coming jazz, R&B, world beat, pop or experimental artists, writes Lisa Selin Davis on nymag.com. The Brooklyn Academy of Music offers a winning mix of genres. On weekend nights, the BAMcafé, above the lobby, features everything from folk and spoken word to hip-hop and world music. BAM’s NextNext series emphasizes performers under the age of 30, such as Carl Hancock Rux, Chocolate Genius and Antibalas, while the SistaFactory regularly puts on shows with female artists, according to Time Out New York. 2005 New York Magazine’s best place to see new and old Hip Hop [Park Slope doesn’t exactly ring with hip-hop lore, but since the biggest M.C.’s are hard to catch outside stadiums, the left-field acts—like A Tribe Called Quest’s Ali Shaheed Muhammad and Blackalicious’s Lyrics Born—who play this intimate setting are a worthy substitute.] On nymag.com. This cool, spacious Park Slope venue welcomes prime outfits that would otherwise play in slightly larger Manhattan rooms (the Raveonettes, the Dirtbombs), according to Time Out New York. Photo courtesy of roboppy on Flickr.com.